While in school Brad spent time working in several different physical therapy settings including inpatient general medicine, outpatient pediatrics and outpatient orthopedics. Since graduating he has further expanded his orthopedic background by regular attendance of continuing education courses utilizing instrument assisted soft tissue massage, active myofascial release, cupping, kinesiotaping, manipulations and various other manual techniques to help his patients. Brad has a strong background in therapeutic exercise through his CSCS certification and over 10 years experience as a personal trainer. In addition he has expanded his practice to include specialties such as vestibular rehab, pediatrics and the treatment of TMD. Brad’s interests include orthopedic/sports rehabilitation, fitness and conditioning for all populations. 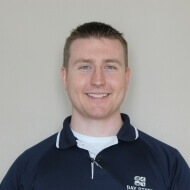 Brad is currently a full time physical therapist in West Bridgewater and is the regional manager of the Quincy, Dorchester, West Bridgewater and West Roxbury locations. Brad enjoys doing home improvement projects and staying active in his spare time. He also enjoys working with his personal training clients and reaching out to the community by hosting conditioning clinics for several local sports teams.